Our Better Homes and Gardens Steele Display Hutch is the perfect addition to any space in your home. Stylish and contemporary shelves feature clean lines and a rich finish that will complement most any decor. The open cube structure and two large storage drawers make it the ideal solution for all of your storage and display needs. Metal hardware with a black powder coated finish adds a polished look to the bookshelves to brighten any room. Store any items you want unseen in the spacious drawers that feature drawer glides for easy opening and closing capabilities. You can maximize space in your home and add style in one. 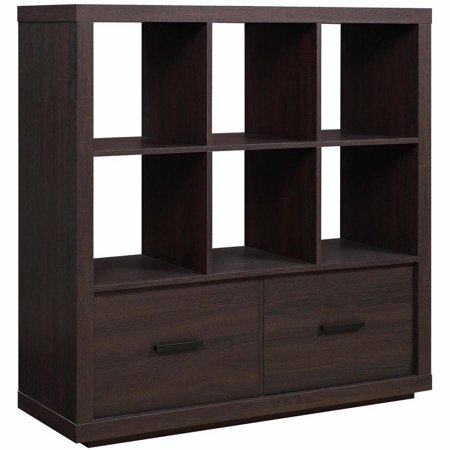 This storage hutch is perfect for storing your favorite books, cozy blankets and displaying your best photos and decor. Coordinates with other items in the Better Homes &amp; Gardens Steele Collection and accommodates most Better Homes &amp; Gardens Collapsible Fabric Bins (sold separately). Our Better Homes and Gardens Steele Display Hutch is the perfect addition to any space in your home. Stylish and contemporary shelves feature clean lines and a rich finish that will complement most any decor. The open cube structure and two large storage drawers make it the ideal solution for all of your storage and display needs. Metal hardware with a black powder coated finish adds a polished look to the bookshelves to brighten any room. Store any items you want unseen in the spacious drawers that feature drawer glides for easy opening and closing capabilities. You can maximize space in your home and add style in one. This storage hutch is perfect for storing your favorite books, cozy blankets and displaying your best photos and decor. Coordinates with other items in the Better Homes & Gardens Steele Collection and accommodates most Better Homes & Gardens Collapsible Fabric Bins (sold separately). It's a lot to put together but once it's up it looks great! And awesome space saver it's heavy and sturdy. Sturdy and fits a lot! Took almost 5 hours to put together myself, but am super pleased with result. The only reason why I don't give it a 5 star is because of the difficulty in the assembly of the product. It requires 2 people ( make sure the other one knows how to drill screws). The instructions are very easy to follow and took about 2 hours for me and my husband to put together. The product looks great, sturdy and provides adequate storage space. I bought the cube boxes( better homes & garden) and they fit just right. The quality of the product is good. Satisfied with purchase. Only problem was getting someone to assemble the organizer. It is together and in place. There is lots of storage space which has taken care of my storage problem. I like the color but had to purchase the storage boxes else where. This was my first time making an order at WalMart for this type of purchase. Very good experience. This product was just what I was looking for. Easy to assemble (took me 5 hrs, alone). Just wish at least 2 or 3 baskets were included. Very pleased. Lots of storage space and very solid piece of furniture. A little bit of a pain to put together, but I expected that from reading other reviews. One corner was damaged, probably during delivery, but luckily it is at the back of the piece so it isn't visible. I'm overall happy with my purchase. I had two pieces that came snapped in half. Luckily, they were pieces that attached to the bottom for hardwood floors, so I was able to go without them. I also had to fix one of the rollers on the drawers, which was very tedious and time consuming. Assembly took about 3 hours. However, the finished result is gorgeous and sturdy! Hello Ivy! Thank you for purchasing our product and for taking the time to provide us with your feedback. We are happy to hear you are satisfied with the end result! If you need any assistance with replacement part(s), please feel free to contact our Customer Service department at 1-866-942-5362; we look forward to hearing from you! This storage organizer looks okay. I thought it would be a better quality. Just particle board. Directions were easy to follow. And it went together pretty well. Took us a couple of hours. When assembling the first drawer, we had it lying on cardboard face down when we softly tapped in the dowels they cracked through the face. Apparently we should have had it face down on cement so it wouldn't go through. I don't ever like doing that because I don't want to scratch the face. Disappointed that this happened. Will not buy this brand again. Hello Shelley! Thank you for purchasing our product. We are sorry to hear of your experience and would be more than happy to assist you with a replacement of the drawer front; please reach out to our Customer Service department at 1-866-942-5362 to obtain your information and assist you further. We look forward to hearing from you and improve your satisfaction with this purchase!